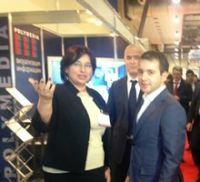 By the anniversary date of the Bakutel2014 exhibition Polymedia, Russian AV leader and software developer, presents the latest technologies and products of IT and AV market. Since the last year's exhibition Polymedia has produced new developments and drastically revamped the current products that were presented in 2013. As a leading expert in situational centers creating and having implemented a number of such projects in the CIS, Polymedia will demonstrate solutions based on integrated systems and software and hardware developments for the visualization management and decision-making. Being at the controls of such a center, any visitor of the Polymedia’s booth would feel himself a chief, easily managing data marts that are displayed on the video-wall of large information capacity and how the modern AV technologies helps in making difficult management decisions. Polymedia presents as well innovative displaying technologies based on LED, multi-touch and augmented reality. «The possibilities of audiovisual and interactive technologies are limitless, and we could not show all our large capability in the integration in a single exhibition booth. However, we collect the most vivid and impressive installations and we will not only present their opportunities, but also give visitors to plunge into the virtual space of technologies of the future», - says Rufat Mammadov, CEO of Polymedia-Azerbaijan. What exactly will be shown and how visitors would move from the booth #1032 at the oil rig? - the Polymedia team steadfastly silent and suggests waiting for the date of exhibition. Polymedia is a member of the International Association of audiovisual systems integrators InfoComm International® and international partner network AV Global Alliance and a multiple winner of the National ProIntegration Awards, and winner of the International InAVation Awards. CEO Elena Novikova is in the top 100 managers association Infocomm, which allows the company to stay abreast of all future global trends, developments and innovations technology industry. Polymedia has extensive experience in the implementation of technically complex large-scale projects for education, public sector, law enforcement agencies, energy, transportation, large industrial enterprises, sports facilities and corporate sector.